We have been sent the following by one of Hodnet’s adopted sons. On 1st September 1939, aged six, I arrived at the primary school in Hodnet where kids from St Cross primary school in Clayton, Manchester, had been allocated billets – except for Brian Baker and me. Eventually Mrs Hallmark at the paper shop took us in for the night. We were taken there and given an old tennis ball to play with in the back yard. Eventually we were told to sit and have some tea and shortly after we went to bed. Next morning we were told we would stay there, which I did for a further 12 years due to my parents’ separation. In 1940 Norman Cooper from London joined but left after a few months, then shortly after that Brian left. My mum used to visit with other mums on a Sunday, but once all the other evacuees had gone back she did not come as there was no coach run. She later stayed with my sister, Lilian, in a house with a family down Paradise Lane. Eventually, Lilian came to stay with me at Mrs Hallmark’s, who by now we called Aunty Doris and her husband Uncle Bill. William and Doris Hallmark had no children. The only heating was a coal-fired stove with a water boiler and oven. A primus stove in the scullery served for extra cooking and there was no fridge, so a larder and meat safe was the only place to store perishable food. Cheese was kept on a covered cheese dish. I remember we had to get water from the outside tap shared with Percy & Maggie France, Jane Rowlands, Jack and Mr Edge. Electricity was installed before I arrived, but running water into the house came later. The bedrooms were very cold in the winter, often with frost on the inside of the window. We had hot water bottles. We would have a bath in an old tin bath in front of the kitchen range. I played with David France and Charlie France who lost his mother. The winter of 1947 was diabolically cold and went on for some weeks, preventing coal deliveries. The snow was a foot deep or more in places. Going to the country was quite alien as I knew nothing about it. Having arrived with my small suitcase and gas mask it seemed a bit strange and scary, but everyone was kind. Times became very interesting and it was not long before I took to being a country lad with open spaces and the ability to play there. I played with a boy from the farm down the street (the Monks? ), just past Taylor’s shop almost opposite Rhodes’s shop. It was a very hot day and we had been playing in a hay field when we were called to tea. We washed our faces to cool at the horse trough hand water pump but the farmer’s son stuck his head under the cold water to cool off. Later that day we were told he had died. It seems the shock of cold water on his head and neck had killed him. If Bill and Doris had a night out, Lilian and I would sometimes stay with Jane Rowlands in her small cottage on the corner of Church Street and Shrewsbury Street, which was snug and had a feather mattress and pillow. Jane was a kind old lady who, I think, had worked at Hodnet Hall for a number of years and had chopped off part of a finger when chopping cow cake. I attended the village school where I think it was Mrs Hughes who headed the juniors at the Lower School in Drayton Rd. Mr Gillibrand was the headmaster who was at the Upper School in Marchamley Rd. He used to play the organ and was choir master at St. Luke’s church where I was in the choir and was also confirmed. Mr Capper was the main bass singer. The Rev Griffiths was the Rector who lived at the beautiful rectory up Hearne Lane beyond Whiston’s farm. We used to go up to a walnut tree where we stained our hands picking green walnuts for pickling – but for eating when ripe! The school encouraged waste paper collection, with cardboard badges of rank according to the amount you collected. In the autumn we had days off to go potato picking for which I could earn some money. Harvest time meant that villagers would congregate in the fields with different means of killing rabbits, hoping to kill them as they ran out. The farmer would allocate fairly. I had a long stick with a knob at the end. This meat supplemented wartime rations. We had a garden including blackcurrants and raspberries, so were able to grow enough to feed ourselves. Jam-making was de rigueur at the time as well as preserving anything that could be preserved. In the shop we sold sweets on ration and soap, which came in a big block that we had to cut up into tablet shape. I helped count the coupons to send off to the Ministry to obtain our next allocation. The sweet ration was very low, but many adults donated coupons so children were given some extra. Cigarettes and tobacco were available, but not always the variety someone might choose. The shop also sold other items needed in a village with very little transport to the towns. I started helping in the shop as well as being paper boy. I took over from Bill Hallmark when he gave up delivery down Station Rd. and beyond, when I had bought my first bike from savings acquired from selling produce from the garden. Due to poor health, Bill was not called up but volunteered to do other work, which meant that Doris Hallmark had to give up her teaching to run the shop which opened from nine until five. The papers arrived about six so that meant Bill had to be up early to prepare them for delivery before going off to his job. Sunday papers were sold at the garage in Station Rd. One of the things I really enjoyed was saving the signal box paper until my last delivery so I could stay in the box watching the steam trains shunting, as well as trying to pull the points levers. They were very hard to operate and the place always smelt of paraffin. In those days there was a station master as well as some porters working in the goods shed and ticket office. There were pens in the goods yard where animals bought at the nearby auction were kept, ready for movement by train. All this disappeared under the Beeching axe. The shop took in laundry which I remember being collected using a Sentinel steam lorry, and later a big van powered by gas held in a big bulging bag on the top. I used to watch the saddler at the garage in Drayton Rd. as well as vehicles being filled with petrol. In those days The Bear Hotel on the corner was out of bounds to me. Going down Back Lane one came to the blacksmith, where I spent many hours watching him make horse shoes as well as shoeing horses. Each horse would have its own individual shoes pre-made to save time. I often watched harvests and threshing with steam engines. Down Drayton Rd. there was a cobbler and Dr. Harvey had his surgery. On the corner nearby was the WI Cottage, with wonky windows, close to the Lyon Hall. Opposite that was the lower primary school where I went when I first arrived in Hodnet. Next to that was where Mr & Mrs Hugill lived when he took over from Mr Gillibrand as headmaster. The post office was on the right until it moved some years later to the garage in Station Road. On the corner of Marchamley Road was the clothier and haberdashery shop of Mr Cornes. Mrs Cornes was the sister of Bill Hallmark. Mr Cornes was one of the very few who owned a car in those days. At the top of the street opposite the Bear was a lamp standard which was removed not long after my arrival, so I hardly remember it. Down Shrewsbury Street was a chemist, a barber, a butcher, another garage and a small village hall called the Reading Room. On Station Road there was the recreation ground with swings, seesaw and roundabout. Football was played in the winter, with cricket in the summer. I used to mark out the lines for the soccer pitch with a push liner. The Working Men’s Club was at the top of the Rec. as it was called. On the other side of the road was a field in which there used to be a bull which had a chain round its neck attached to a huge log to prevent it escaping onto the road. A new fire station was built towards the junction with Shrewsbury Street. Hodnet was a thriving village serving a large parish, including the hamlets of Peplow and Wollerton. Gough’s bakery and shop was only 3 doors up from our paper shop, in between which for a while was a very minor branch of the District Bank which opened 3 days of the week. Arthur France had a cellar where he kept wood etc. for his trade as a cabinet maker. He converted most of it into a shelter where he made bunks for children. Occasionally, we were woken and taken there until the all clear. I sometimes heard the drone of the German bomber engines overhead on their way to bomb Liverpool and that area. The men stood outside to watch them go over. Ternhill Airfield was only three miles away, so it was thought bombs might be dropped there. One incident that made news in the local paper was that a big ball on a gatepost at Hawkstone Hall had been blown off. I spent some time watching Mr France working in his workshop, so became interested in woodwork. Percy France, who lived with Maggie next door to us, was one of the few who had a Ford car which he would use as a taxi. When not at school I would often spend time at Mr Gough’s bakery watching him and Mr Dodd from Wollerton making bread and cakes. Old Sid Gough was a jovial character, as was his son Sid. Eventually I was allowed to help. I later went with young Sid on his bread rounds. On one occasion in Wollerton, having just turned off the main road, the van suddenly stopped. Sid took off his white delivery coat, jacked up the front of the van and discovered it had broken a king pin. Sid had been an engineer in the army during the war, so he soon fixed the steering. We were also delivering groceries so he raided a box, took out a can of peaches and opened it up, whereupon we devoured the lot so he could then cut the tin can so as to repair the steering and enable us to finish the round. He always carried a tool kit, and later taught me how to drive before I was 17. During my time in Hodnet I joined the Air Training Corps 2172 Squadron in Market Drayton in which I stayed until I was eighteen, when I joined the RAF to become a pilot. My career ended in civil aviation as a captain with British Airways. When he sent us his memories above in January 2018, Joe was 84, living in Eastleigh near Southampton and playing golf. 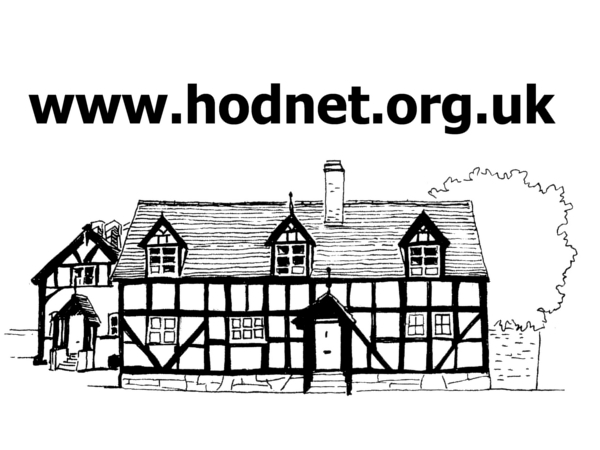 If you have any memories of your early years in the Hodnet area and would like to share them with others, no matter which decades they cover, please do contact the webteam.